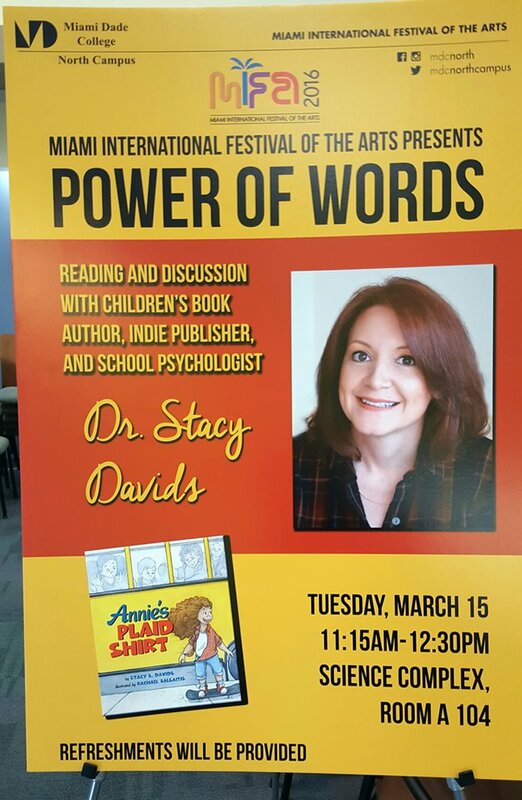 I enjoyed speaking to Miami Dade College students about writing and publishing! The topic of the presentation was called, "The Power of Words." Specific areas I spoke about included: Learning the craft, the importance of children's books, the various genres, typical story structure seen in nearly all fiction books and movies, an overview of the publishing process, and more! Of course, I also discussed my award-winning picture book, ANNIE'S PLAID SHIRT! The attendees asked great questions, including about the decision to feature biracial characters in my book; and they appreciated that my book encourages confidence in kids. ANNIE'S PLAID SHIRT is a Mom's Choice Awards GOLD recipient and a Foreword Reviews' INDIEFAB Book of the Year Finalist. The book has also received numerous 5-star reviews, including from the San Francisco Book Review. Stacy B. Davids, Ph.D. (@stacybdavids) is an author, psychologist, and indie publisher at Upswing Press. Find out more.